Forget the one-size-fits-all high chairs of yesteryear. Nomi have developed a highly customisable chair that can perfectly fit every infant and grow along with them. This is the future of high chairs. Come take a look. 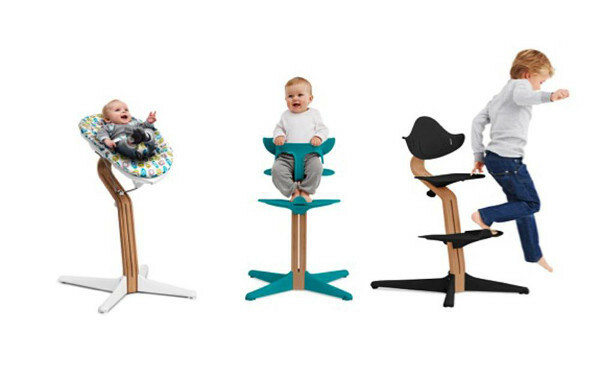 The first thing you may notice about the Nomi high chair is that it looks stunning. More than just a functional chair, this is a design object to adorn the modern home. The stem is made from FSC-certified steam-bent wood and comes in a variety of colours and wood types. Nomi also offer a selection of upholstery and attachment colours so that even the look of this gorgeous chair can be customised to your own unique style. But the Nomi is more than just a chic chair. All pieces on the Nomi can be adjusted without tools so that you can place every part to perfectly suit your child’s growing body. An ergonomic and stylish seat from newborn to teenager. Now that is impressive! You can have fun designing your own Nomi high chair online, and if you want to purchase prices start at E199,95 plus shipping. Nomi are a Danish company and they don’t yet have an Australian stockist but we will be sure to let you know once this sleek seat hits our shores.